Our friends at the Metro Gold Line Foothill Extension Construction Authority just released this new video of a ride along the new light rail tracks from Arcadia to Azusa. The video begins about a mile east of the Gold Line’s Sierra Madre Villa Station in Pasadena just as the tracks soar over the eastbound 210 freeway on the new Gold Line bridge. The trip then passes through all six new stations in Arcadia, Monrovia, Duarte, Irwindale and Azusa. Crossing the bridge over Santa Anita Avenue in Arcadia during clearance testing Monday. Photo: Metro. The video was shot from a truck capable of driving along railroad tracks over several days in October and November. Track work for the project was completed this fall and clearance testing with a light rail car began this past Monday — we have plenty of photos on this earlier post. 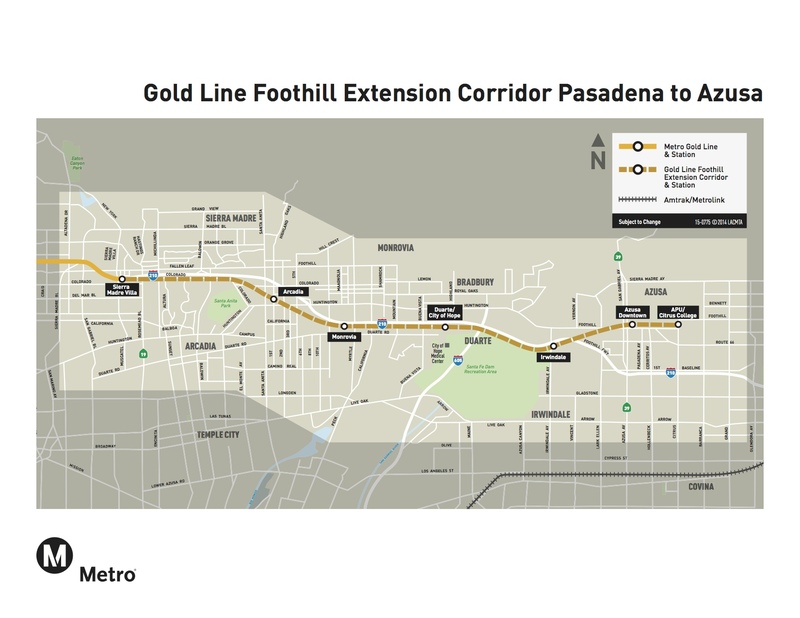 The Gold Line Foothill Extension will run for 11.5 miles from eastern Pasadena to the Azusa/Glendora border and is funded by the Measure R sales tax increase approved by nearly 68 percent of L.A. County voters in 2008. The project also includes a new light rail maintenance campus in Monrovia. The project is being built by the Metro Gold Line Foothill Extension Construction Authority, an independent agency. The Authority is scheduled to complete construction in September and then hand over the project to Metro, which will operate it. Metro is currently forecasting an opening in the first half of 2016 and testing and training are complete. The Construction Authority has a ton of info about the project on their website — including a sign-up for construction and project updates. Please check it out. Posted too soon, who is performing the music? I guess at some point in the future, after the completion of the Regional Connector, this line will have to be rebranded as part of the Blue Line, as was originally planned, right? And is Metro going to have to replace all of those station pylons on both the future blue and gold lines that will then be the wrong color after the routes are changed? After the Regional Connector is completed, there will almost certainly be new names for the east-west line running from Santa Monica to East L.A. and the north-south line from Azusa to Long Beach. Obviously between now and then a decision will be made about line colors. At this point, the Connector is forecast to be completed in 2020 so the pylons at the existing and future stations will have gotten some use. I don’t believe changing the color is a major ordeal and it’s part of the cost of expanding the system. True…also don’t forget that all the stations’ color dot identifiers (on the signs along the platforms) will have to be updated as well! Also, keep in mind the current pylons that Metro uses are stainless with a black wedge-shaped insert. Unless station names change, the only elements that will need to be swapped out are the colored circles on the inserts. My guess is that Metro will use the opening of the Regional Connector as an opportunity to finishing updating the older solid-color wedges to the current black wedge standard. I am confused; Is the Metro Gold Line Foothill Extension Construction Authority a part of Metro? If not, why are they allowed to use the term “Metro” in their name? What does the Minister of Truth not want taxpaying citizens to see? I believe the photoshopped out some graffiti on that bridge just past Irwindale. Don’t want to give the graffiti artists any publicity.